As those who’ve seen James Gunn’s Guardians of the Galaxy Vol. 2 will know, there are no less than 5 post-credits scenes for fans to feast on. It’s a lot, sure, but they’re all amusing little moments and while most of them don’t feature anything significant, there’s one in particular that’s got people talking, as it finally introduces a character that we’ve been waiting to see in the Marvel Cinematic Universe for some time now. That’d be Adam Warlock, a popular cosmic hero from the comics who’s closely associated with the Guardians. Given his tease at the end of the aforementioned sequel, most fans assumed that they’d see him next in Avengers: Infinity War. Having the character appear in that film would make sense for a number of reasons, not least because in the source material, Warlock is heavily involved in the fight against Thanos. After all, he’s one of the few people capable of stopping the Mad Titan. As such, you’d think Earth’s Mightiest Heroes would be calling on him for help, right? This isn’t the first time we’ve heard that Warlock will be sitting out of Joe and Anthony Russo’s upcoming blockbuster. Kevin Feige said as much the other week, in fact, but rumors have still persisted that he’d at least be showing his face for a quick cameo. Gunn has now put an end to all that speculation though, confirming that audiences are going to have to wait a while before they get a chance to become properly acquainted with Adam. Of course, the question now is: where will Warlock appear next? Guardians of the Galaxy Vol. 3 seems like a pretty good bet, but is the studio really going to wait that long to bring him back? Perhaps, but what about Captain Marvel? He’s been associated with her in the comics so it wouldn’t be too difficult to throw him into Carol Danvers’ solo outing in 2019. Who know, though? Plans for the MCU’s future remain pretty unclear at the moment and until 2018 rolls around, we wouldn’t expect to hear much more about this. In any case, it’s probably best that Marvel leaves Adam out of Avengers: Infinity War. That film is going to be unbelievably busy as it is and when you think about it, it’s probably not the best place to try to formally introduce an important character like this. Such a thing is better left to a movie where he can get a bit more breathing room and take up a good chunk of the spotlight. At least, that’s our opinion. What do you think, though? 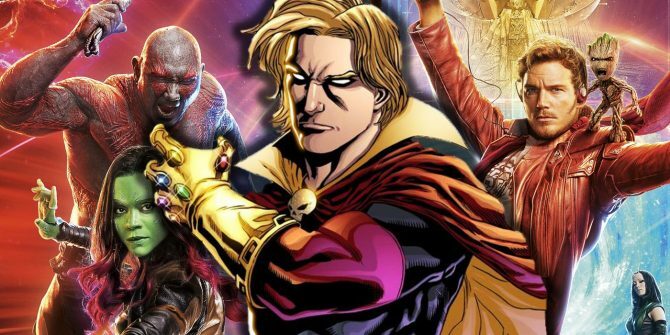 Should Marvel have put Adam Warlock in Avengers: Infinity War, or are you alright waiting a while to see him again? Sound off in the usual place and let us know.